Car wash development involves a five-phase process: select advisors, choose location and develop layout, obtain entitlements, construction and plan execution, and business launch. Driving this process is a business concept or idea. For example, if a property is to house a convenience store and gas station, the owner’s concept might be to offer customers a complementary service such as an automatic car wash. Here, a sales consultation with an equipment supplier would lead to confirmation of format (e.g., in-bay automatic), and a solution would be presented based on the marketplace dynamics. Included in this solution would be an initial site plan and system drawings to validate that the format will work and to help frame in the budget. 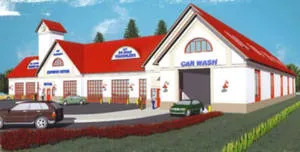 Standard for most gas sites is a modest car wash building with basic components, in-bay rollover, freestanding dryer, and support equipment. This simplicity allows for a short development cycle whereas most investor sites take between 12 and 18 months to complete. Longer development cycles occur when the business concept or idea is more involved than say an “investor-ready” project. To illustrate, the drawing above was a developer’s vision for an exterior express conveyor car wash in West Virginia. One of the challenges of this project was trying to figure out how to place an irregularly shaped building on an irregularly shaped lot with a number of utility easements running through it. The development cycle was also lengthened by the additional time and effort required to design and build a structure with a unique mix of architectural materials. Projects can also be delayed due to mistakes. In this case, the contractor made a grievous error during construction and an entire exterior wall had to be torn down and rebuilt. Furthermore, additional time was needed to install and calibrate a “one-of-a-kind” touchless robotic conveyor car wash system. Of course, the proof is in the pudding. As shown above, the longer development cycle was certainly worth it. Dovetailing on his vision, the developer built a separate detail center (shown above) on an adjacent lot with service bays and a 100’ belt conveyor for high-volume work. This facility was built after refining the car wash operation. 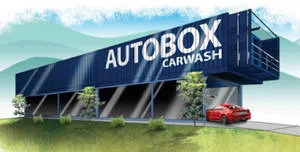 Up next for this entrepreneur is a sustainable building design where the car wash building will be constructed with steel shipping containers (see above). Shipping containers are made of corrugated weathering steel commonly known as “corten.” Sizes are 8’ wide by 8’ high and either 20’ or 40’ long.Construction risk can also lengthen the development cycle. So while there are cost savings, additional time and effort will be needed for architectural design services and outfitting and rigging of the containers for fixtures and equipment. Decisions related to services design can also lengthen the development cycle because it’s most linked to the concept of service quality and customer satisfaction. Shown above is a developer’s vision and realization for a multiple profit center car wash located in Massachusetts. 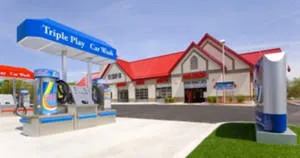 This three-acre site contains an express tunnel, vacuums, in-bay automatic, full-service oil change, detail shop, gasoline bar, convenience store, deli, and drive through coffee. Consequently, the development cycle was lengthened due to the number of permits required and additional time and effort necessary to obtain approvals and entitlements. Construction risk can also lengthen the development cycle. For example, due to the size of this property, the project was developed in two phases. First, the c-store, drive through, and gas bar was built and up and running, and then the wash and lube operation was developed. And finally, shown on page 24 is a developer’s vision and realization for a prototype mini-tunnel and car wash building. Interestingly, the idea for this project originated from a surplus Quonset hut the owner had on an office and warehouse property located along a four-lane divided highway.Driving the process is a business concept. The Quonset hut is a lightweight, prefabricated structure of corrugated galvanized steel having a semicircular cross-section (barrel vault) developed in the United States during World War I. Here, the owner cut out individual sections of steel and replaced them with plexi-glass and installed a used 80’ conveyor from a gas station along with some canister vacuums to create an express-exterior wash. This proof of concept was then used as a basis to design and fabricate a 1,200-square-foot version made from heated, treated aluminum ribs, polycarbonate glazing, and architectural roof panels. The development cycle for this project was lengthened due to time and effort involved with obtaining a trademark and an engineering stamp for the building, designing a see-through divider wall for the mechanical room, and outfitting a 40’ wash-bay for the express-exterior conveyor.